All parents are welcome to attend regular school Eucharist services which are held at St. Mary’s church, Brighstone – see the Buzz for further details. All pupils are invited to join a group which meets weekly after school in the spring term to explore the Christian faith. For some this might lead to Confirmation. For further information, please click on the link below. St Mary’s, Brighstone is part of the Five Churches team which also includes Brook, Mottistone, Shorwell and Kingston. Five Churches – a link to the website which covers our own church, St. Mary the Virgin, Brighstone, and the others in our parish. Rev’d. Clive Todd – Rector of Brighstone, Brook & Mottistone, Shorwell, Calbourne, Thorley, Shalfleet & Newtown. Our Archdeacon is The Venerable Peter Sutton, Archdeacon of the Isle of Wight. 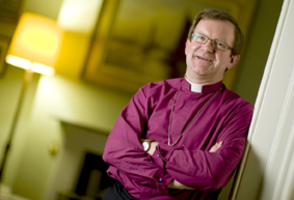 Our Bishop is The Right Reverend Christopher Foster, Bishop of the Diocese of Portsmouth.